You thought that Chinese were tea drinkers? Get on the next plane to China and see them drinking coffee! Once upon a time every non-Chinese, when asked about the favourite drink of the Chinese, would answer: tea. Foreigners brought coffee with them and introduced that brew to their Chinese friends and business relations. As a result, a number of Chinese in major port cities, where the foreigners were typically concentrated, acquired a taste for that brew as well. Today, tea is still the leader by a massive margin, though coffee is charging forward in leaps and bounds. 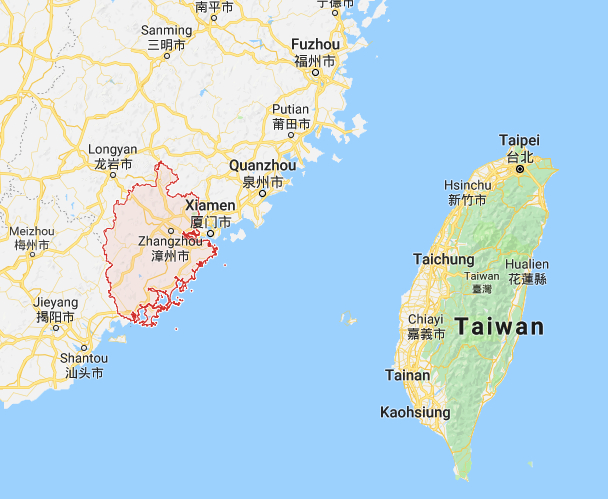 Manager Wang of Damin Food (Zhangzhou, Fujian), a manufacturer of instant teas and coffees, still remembers that when he was at university in Zhangzhou, there were at most 10 coffee shops in the entire city. When he moved back a couple of years ago, there was one street alone with 10 coffee houses. That’s how things are changing, and we are starting to see real growth outside the metro cities. A trend towards coffee culture has developed over the last half-decade largely through the influence of cosmopolitan Beijing and Shanghai, the drivers of Chinese fashion. Now, the coffee shop has become a common and popular place that many people of moderate income can afford going to. Statistics show that in 2014, China consumed over 500,000 mt of coffee, and the retail sales volume was near RMB 60 billion. There are 13,600 coffee shops, 2,200 associated companies, and 500,000 industry-related employees throughout China. 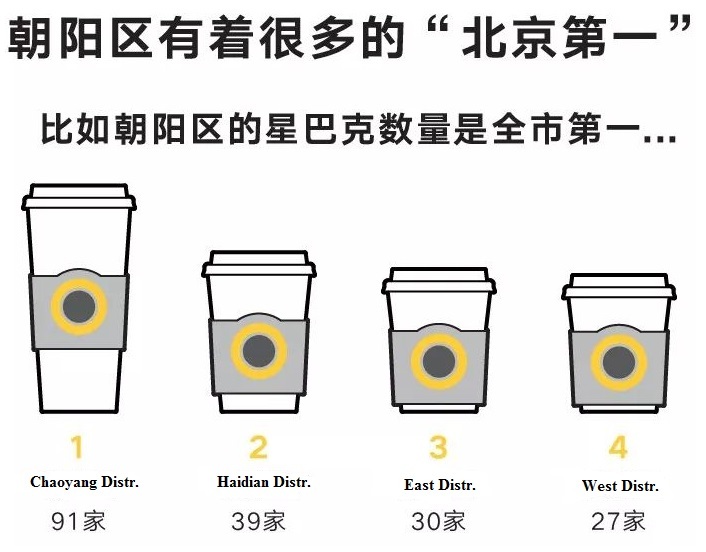 However, the annual consumption amount per capita in China currently is only 5 cups, far behind 300 cups for Japan and Korea, and the world average of 240 cups. This is due to the fact that coffee consumption is large in the cities, but still small to non-existent in the countryside. There is room for an annual increase rate of 15-20% for the coming years. Vietnamese coffee beans accounted for 35% of those imported by China in 2017. However, other coffee exporting nations like Colombia and Brazil have all set up promotion offices in China. Chinese coffee imports grew by 16% year-on-year in 2017, compared with about 2% in the United States, the world’s largest coffee consumer. China’s currently low average rate of coffee consumption, in tandem with its status as the most populous nation on earth, add up to real market potential, especially as sales of ready-to-drink (RTD) coffee products are soaring. Research carried out earlier this year shows that thus far the most significant strides have occurred in the instant coffee market, which reached over US 1 billion in retail sales in 2012. However, since 2011, RTD coffee has consistently boasted the strongest volume growth of any Chinese beverage category. The RTD coffee segment growth of 22%. Fresh coffee, though, remains a niche product. Its demand, due largely to its convenience, is mostly from recent adopters who tend to be unfamiliar with fresh coffee preparation methods and who often lack the appliances needed to make it. In terms of flavour, instant coffee’s ability to be packaged as a mix with sweeter and other additives appeals to the Chinese palate, which generally prefers milder, milkier coffee to the stronger, acid profiles often evoked by fresh coffee. Indeed, the most popular type of instant coffee in China, which accounted for 52% of the segment’s sales in 2012, are three-in-one mixes that include a mix of instant coffee, creamer and sweetener. Nestlé’s Nescafé is the dominant player in both instant and RTD markets, accounting in 2012 for half of the entire RTD market, and just shy of three-quarters of the instant market. While the brand has a global instant share of 46%, its strength in China is unsurprising, though the strength of its RTD sales in the country is very different to its global weight of just 3% share. 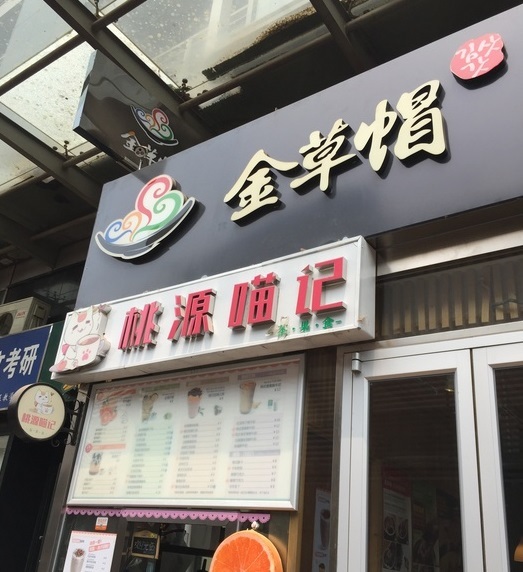 According to analysts, currently, on China’s coffee shop market, there are three distinct competing forces: Chinese domestic, European and American, and Korean and Japanese. They are engaging in different strategies to strengthen themselves. For instance, Sculpting in Time is trying to take the advantage of e-commerce. In December 2014, it established a professional coffee website, Hello Coffee, where visitors can see all relevant information about coffee making and consumption. Hello Coffee says it is China’s first B2C coffee website. Starbucks places more emphasis on fast coffee serving in the shop. It also takes measures to encourage consumption outside of the coffee shop. Mid 2018, Starbucks is present in 147 Chinese cities with a total of 3362 outlets, including 7 cities with 100+ outlets. Shanghai is the largest with 663 stores. Starbucks has announced that it intends to run 6000 outlets by 2022. Costa Coffee, a British multinational, plans to open 900 more stores in China by 2020, which will give it 1344 shops in the country. Korean coffee shops are dedicated to business alliance. 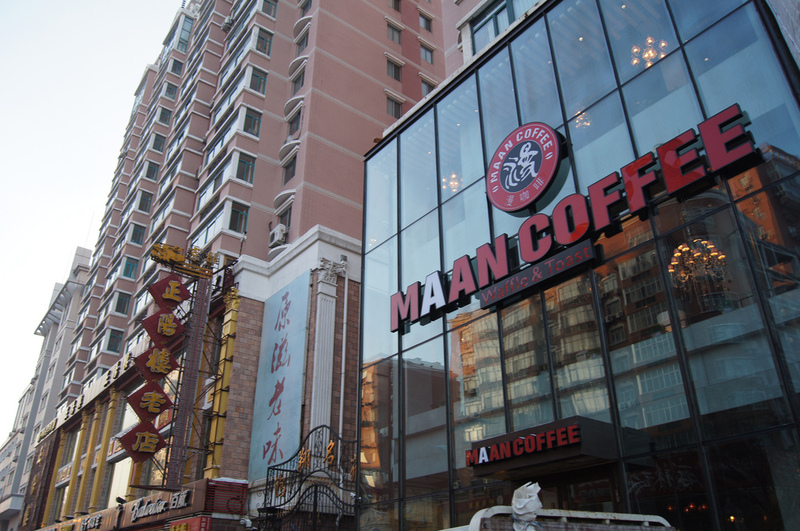 What is more, Korean coffee shops, such as Caffe Bene, Maan Coffee and Zoo Coffee, have entered China’s market. However, this business alliance mode does not seem to work smoothly. In the course of 2015, Caffe Bene started to show cash flow problems and soon the Chinese mother company stopped injecting further capital in the venture. You can still see several Caffe Bene outlets operating in Beijing, but shops in other cities have closed down one after another. Insiders believe that the chain will disappear complete during the first months of 2016. Zoo Coffee is also reporting problems in developing the Chinese market. The management has decided to quit the franchising system and only operate wholly owned outlets. It has also stated that it wants to alter its ‘Korean’ image to avoid Zoo Coffee running in the same problems as Caffe Bene. Industry insiders believe that chain coffee shops should be prepared to face the challenges from fast-food restaurants and convenience stores as well as milk tea stores. According to these analysts, coffee shops should focus on their unique service rather than size, since consumers might stay there for a long time, thus increasing their operating costs. Also, they suggest coffee shops host some activities in order to boost their business and advertise themselves. Actually, there is also a third force emerging in this market: the private coffee shop. It needs a lot of courage, but there are single Chinese coffee entrepreneurs who do not want to tie themselves to one of the big names and set up their own, often single-store, coffee shop. One of my favourites is Taoyuan Miaoji, located in an alley opposite the main gate of the University of International Business and Economics (UIBE). It is an ideal spot for a quiet talk with friends. The site Dudihui is a blog consisting of infographics about Beijing. A blog posted mid 2018 compares the size and development of the various districts of Beijing. One of the dimensions in that infographic is the number of Starbucks outlets in the district. It is shown in the following picture. It is the strongest sign of the symbolic value of coffee shops on present day China. An interesting detail is that the Chaoyang Distr. with its foreign embassies and CBD has more coffee shops that the university district Haidian. Coffee is often associated with Italy, but Germany has played an outsized role in its history too. The paper filter was invented by a Dresden housewife, and the city of Emmerich am Rhein was home to one of the first automated drum roaster. Now, there’s another reason to turn to Deutschland for your java fix, with the arrival of Hanover Coffee in China. Founded by Andreas Berndt in 2011, the former marketing man opened the first premium coffee bar and bean shop in Hanover, which has since grown to supply private customers, high-class hotels, restaurants, companies, and cafés in Germany with over 30 different types of coffee beans. Last year, Berndt’s sons, Fabian and Flemming, came out to China to set up their first overseas branch. Now operating out of a roastery in Changde, Hunan province, where a ‘German Town’ has been erected (the photo shows the roastering plant in that town). They use a the medium roast, also known as a Vienna roast, which is not too light or dark. The coffee beans are roasted at around 190 degrees Celsius, or as low as possible, to preserve the full aroma. They use a Probat drum roaster from Germany. Their green beans are checked in Germany before they’re shipped to China and checked again. The nationalist trend in Chinese politics is also entering the fierce competition in the coffee market. Newcomer Luckin (Ruixin) Coffee, with its HQ in the coastal city of Xiamen, opened 525 stores in the first four months of 2018. It has wooed more than 1.3 million customers and created an internet frenzy by challenging coffee giant Starbucks. With investment of more than RMB 1 billion from Lu Zhengyao, CEO of car rental company Ucar Inc, and other founding members, Luckin Coffee aims to grab some of Starbucks’ market share with a combination of delivery services, lower prices and smaller-sized stores－a brand strategy it calls Any Moment. Qian Zhiya, CEO and founder of Luckin Coffee, and previously an executive at UCar, said the goal is to offer Chinese consumers an alternative to Starbucks. “The market will not only have Starbucks. Every country has their own coffee brand,” Qian said. Luckin Coffee said their secret ingredient for creating “a decent cup of coffee” is their select Arabica coffee beans, world-leading coffee machines and professional baristas. Of its stores already in operation, 294 are brick-and-mortar cafes between 30 to 50 square meters in size. Some 231 receive delivery orders only. Qian said, in the future the delivery kitchens will comprise less than 15 percent of the total. Luckin Coffee even started to involve the courts in its competition with Starbucks in May 2018. Luckin accused Starbucks of monopolistic activities, because it prohibits owners of properties in which it has set up shop to also sell space to competitors. This case will be hard to win for Luckin, as I can name numerous locations in various cities in China where Costa Coffee or Pacific Coffee have opened outlets very close to a Starbucks shop. However, it will be interesting to see how the court reacts. It seems as if Luckin is trying to cash in on the nationalist trend in China, emphasising the foreign nature of Starbucks. Luckin Coffee announced on July 11, 2018 that it had raised USD 200 million in a fundraising round that values the company at USD 1 billion. Investors are said to include Singapore sovereign wealth fund GIC. The company intends to open another 2500 outlets in 2019. More domestic coffee entrepreneurs are following the example of Lucking Coffee. A newcomer worth watching is Coffee Box. This chain emphasises coffee drinking as a total experience. Coffee Box picks business districts of major cities as the locations for its ‘experience shops’. A more locally concentrated chain is Buzztime Coffee in Shanghai. This chain opens relatively small outlets in areas where restaurants and small shops are concentrated, as a more homely alternative for the more crowded and noisy coffee shops. Shanghai-based Unibrown Coffee is playing the high-end ‘specialty coffee’ card. Greybox Coffee and Soloist fall in the same category, but then geared to those who are passionate about coffee. Soloist baristas do not want to be addressed with ‘waiter (fuwuyuan)’ but with ‘coffee master (kafeishi)’, in an effort to link the Chinese term for barista to their own brand. A lesser known newcomer is Beijing-based Coffee08. Minicoffee (Xiaojia) specialises in milk coffees. Uin Coffee positions itself as a high tech coffee maker. ParCoffee is also based in Shanghai, with its most famous coffee cup shaped outlet near Huashi Plaza. The number and speed of new coffee concepts launched in China is so high, that keeping this post up-to-date is a genuine challenge. A catching feature of Fish Eye Coffee (see following photo) is filter coffee; you can watch your brew appear drip by drip. 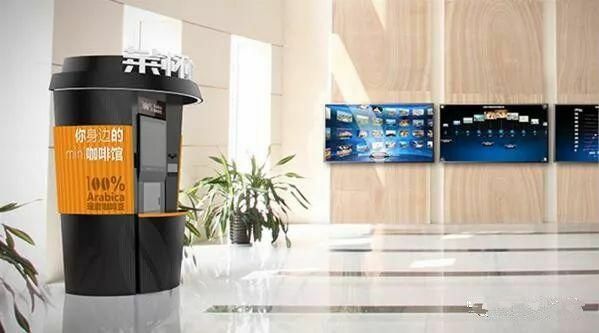 Laibei Kafei, a transliteration of the Chinese expression for ‘give me a cup of coffee’, is China’s first supplier of coffee vending machines. Supermarkets, shopping malls, etc., can place them in suitable locations to provide coffee to their patrons, with all the issues that come with establishing a coffee corner with life baristas. The Palace Museum opened a coffee shop for the modern-day guests of Chinese emperors over the weekend－the Corner Tower Cafe－and it quickly became a hot spot for visitors, bringing traditional cultural heritage closer to the younger generation. The cafe serves more than 30 kinds of coffee, tea and other drinks－priced between 22 and 45 yuan－for 40 guests at a time. Visitors don’t have to buy tickets for the museum to enter the cafe. Officials said a restaurant, also called Corner Tower, will open soon near the museum entrance. This move is slightly controversial. Some years ago, Starbucks was not allowed to open an outlet in the Palace Museum, because ‘a coffee shop does not fit into that historic ambiance’. While coffee is a staple everyday purchase for most office workers in the UK, it is considered a premium product in China and is a luxury out of reach of most average workers. In Starbucks, a medium latte is RMB 30. Starbucks has come under fire by state media in China for their high prices, especially as the cost of doing business is generally considered to be cheaper in China. The average monthly wage in Shanghai is RMB 5891, less than a third of the average wage in London, making a RMB 30RMB cup of coffee a luxury most can’t afford. However, a high price is considered a sign of quality in China. The more expensive the better. There is still this concept in China, and Starbucks and Costa realise this. They want to brand themselves as premium chains, that’s why they price slightly higher in China. Most of the coffee on sale in coffee outlets in China comes from imported beans. However, China is also growing as a producer of coffee, with the majority grown in Yunnan province in southern China. You can read more about that in my special post on coffee and tea in Pu’er. From 2017, several new coffee shop chains have popped up in China. Most of them position themselves in the higher end of the business. 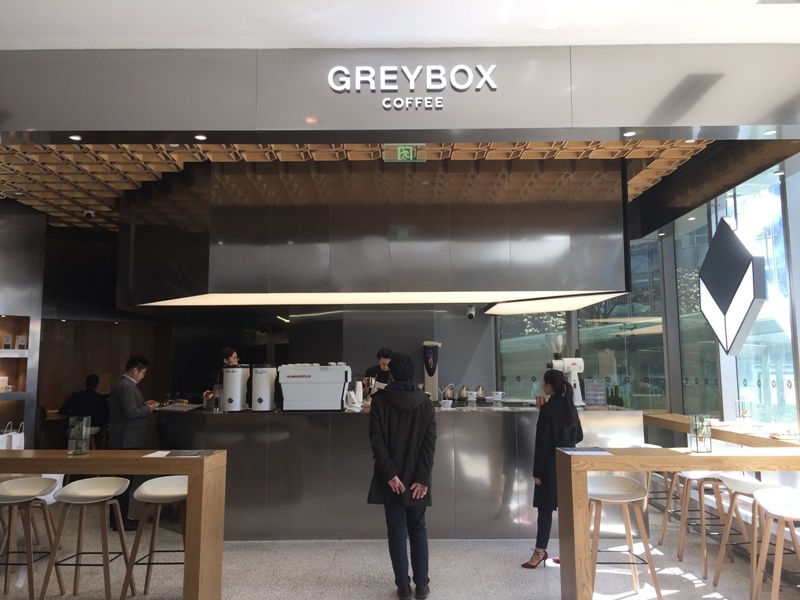 A good example of this type of coffee shops is Greybox Coffee that likes to set up shop in business districts in major cities. 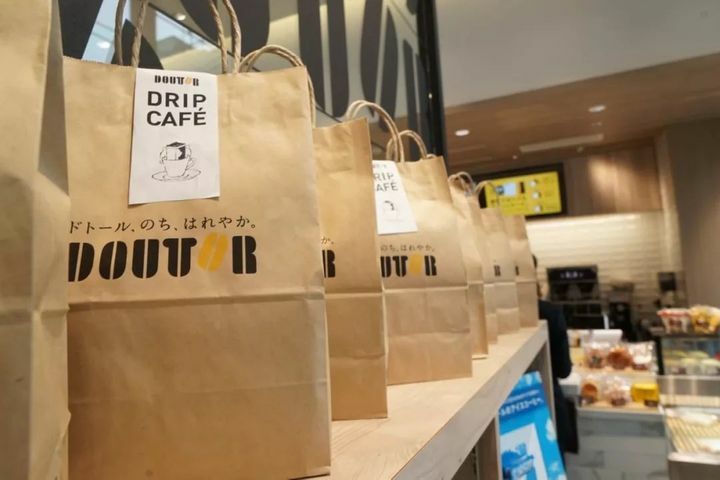 Japanese niche coffee shop Doutor has also set up shop in China, in a joint venture with a local partner TANSH Global Food Group which runs the Shanghai Min and Maison De L’Hui restaurants. With a 65% stake in the venture, Shanghai-based TANSH facilitates Doutor’s mainland operations. The Shanghai Free Trade Zone has just established a Coffee Exchange Centre to boost the China trade for what is the oldest intercontinentally traded commodity in the world. It is not compulsory for companies to trade in the center, but those which do will benefit from Free Trade Zone’s duty-free and foreign exchange policies. By the end of 2015, both companies and individual customers will be able to buy coffee beans on the center’s website. The new center is projected to conduct transactions worth RMB 120 billion by 2018, and aims to overtake Singapore as Asia’s largest coffee exchange. 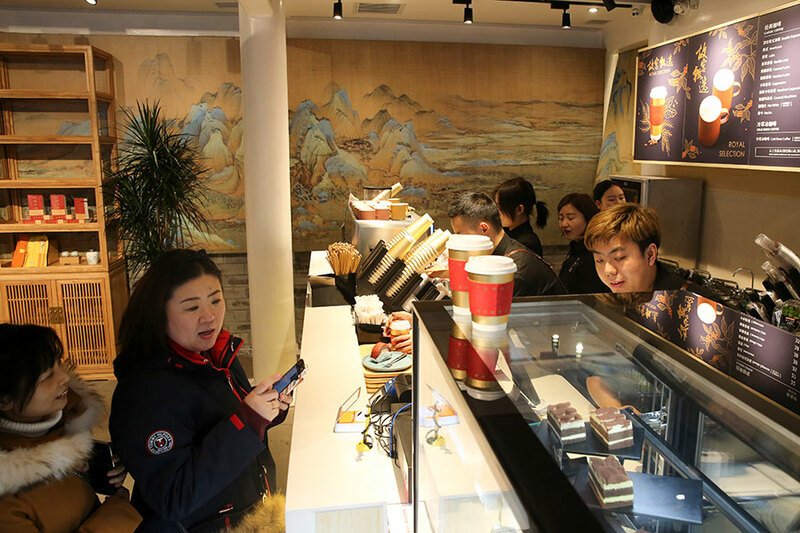 Besides the wide array of international and domestic coffee chains that are popping up in China’s major cities, some coffee places of the old days are being revived. A recent example is White Horse Coffee, a coffee shop established in the Jewish quarter of Shanghai, when a large number of Jewish refugees settled there in the 1930s. 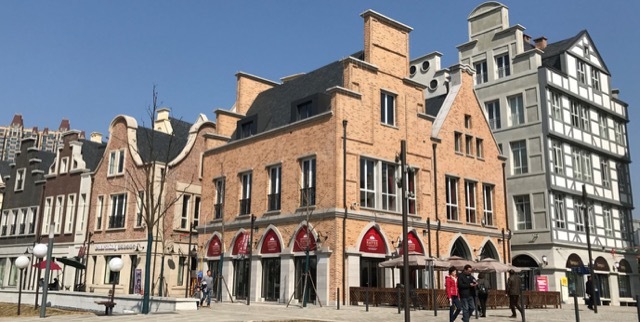 Hongkou district’s government decided to rebuild the “White Horse Coffee” as part of Shanghai Jewish Refugees Museum’s extended exhibitions. The new “White Horse Coffee” will be located opposite the Shanghai Jewish Refugees Museum. The design and decoration of the new “White Horse Coffee” will stay as close to the original as possible to provide a glimpse into the life of Jewish refugees of that period. A Tibet-inspired coffee shop, Charu, has recently opened in Chengdu (Sichuan). The place is spacious, outfitted with aged wood panels, edgy houseplants, and dangling Edison-style bulbs. It’s staffed by young people and the couches are upholstered in different shades of blue—the sort of patterns you would expect from a swanky Malibu patio by the beach. The word charu refers to the toggle that links yaks together, according to Tsehua, one of the owners. It connects the tents and the yaks together. Like the charu, this cafe to connect people together. Charu has a beverage menu of yak-based drinks—among which is yak milk coffee, decorated with the cafe’s logo. The milk is brought in weekly, sent overnight from Tsehua’s nomadic village of Hongyuan. There’s yogurt, which is made in the same place, and as an option, it can be supplemented with highland barley and raisins. The menu also features a juice squeezed from sea buckthorn, a berry from the Himalayas that tastes like a cross between a mango and an orange. It is this type of new hip spaces that multinationals like Haagen-Dazs find it hard to compete with recently. 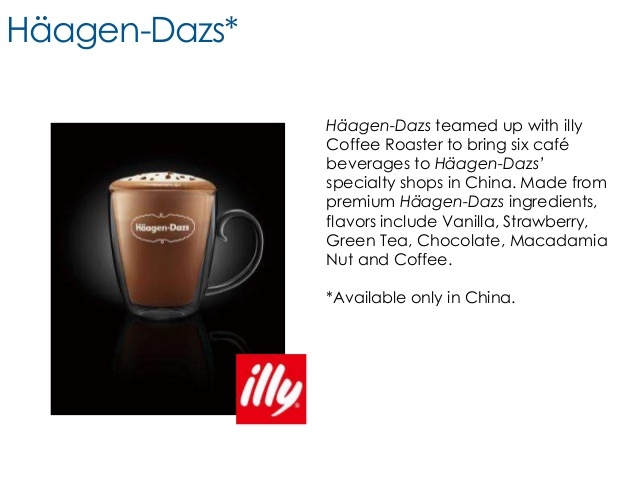 The ice cream maker has started cooperating with Illy in China. Its outlets can now also function as alternative for the crowded coffee shops. Coffee has now become so popular, that the word is gradually transforming into a symbol for a modern leisurely lifestyle. 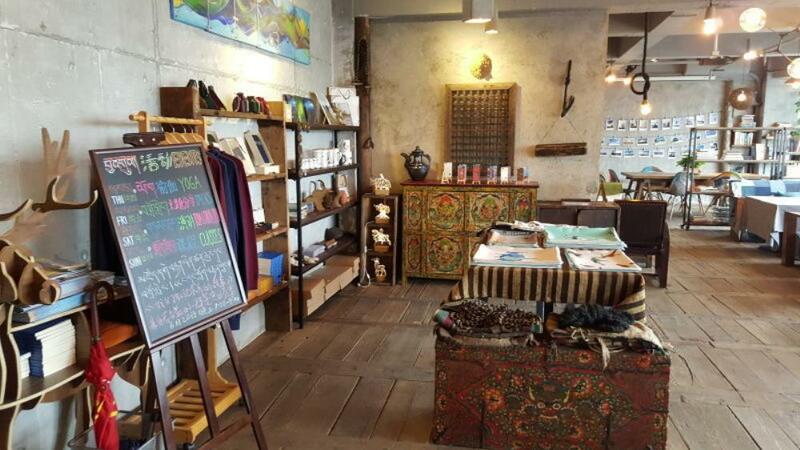 A traditional Chinese medicine (TCM) store in Hangzhou (Zhejiang) has developed ‘herbal coffee‘ to wrap that traditional product in a modern package. As coffee is growing more and more popular, many Chinese producers of foods and beverages are developing coffee flavoured varieties of their products. A good example in an earlier post is: coffee flavoured plums. Snack producer Sanquan (Zhengzhou, Henan) has launched a coffee-flavoured zongzi in 2018. One of my personal favourites is affogato, one or two scoops of basic vanilla icecream soaked in strong espresso. I first found it in China in some häagen-dazs outlets, but was not impressed by it, mainly because the coffee wasn’t strong enough. 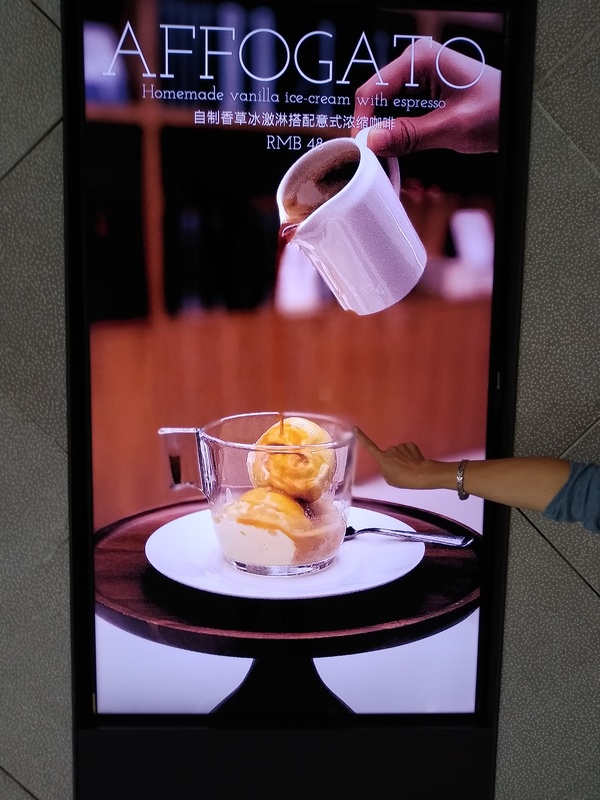 I was pleasantly surprised to find a decent affogato in a new (not yet opened) hotel at the north end of Wangfujing Street in Beijing during in September 2018. A Chinese investor based in China’s northernmost city Harbin (Heilongjiang) is investigating the possibilities of investing in a 400 hectares coffee farm in Argentina, in cooperation with a local overseas Chinese partner. The coffee is to be roasted in Harbin, using technology imported from Brazil. I will keep you informed about the developments of this project. The Harbin region currently consumes about 60 mt of coffee beans per year. 2017 Hainan International Coffee Congress and Beverage Expo (2017 ICoffee Expo) will be held 1 – 3 Dec., 2017 at Hainan International Convention & Exhibition Center and Haikou Marriott Hotel. The event aims at high-end, internationalisation, and professionalisation. In the background of international positive response to the Belt & Road (OBOR) Initiative, Hainan, as the beginning station of Maritime Silk Road along which line locates considerable coffee growers is recognized with its coffee products and relevant cultural communication. 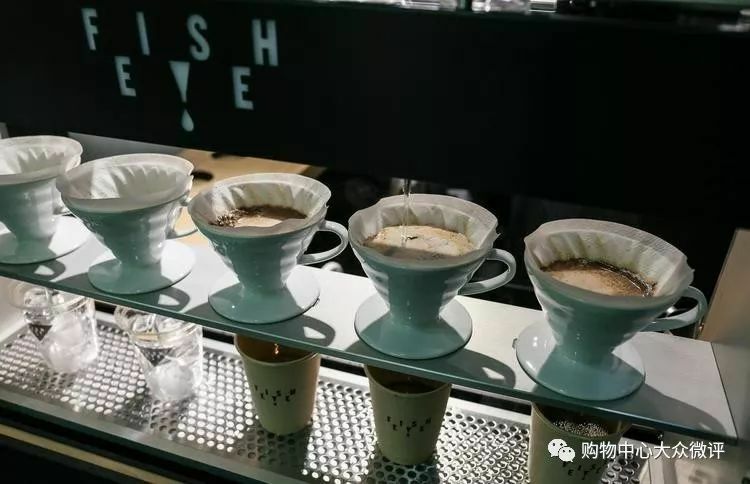 Coffee has now become such an important item in the lives of more and more Chinese that domestic coffee companies have started looking at expanding their activities to related products. Hogood Coffee (Yunnan) announced the development of a healthier alternative for vegetable fat, the main ingredient for coffee creamers, based on walnut protein.